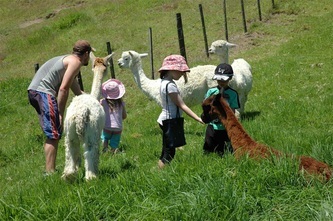 We had a wonderful day with over 200 people coming to see the alpacas. The weather was great though perhaps a little too hot. 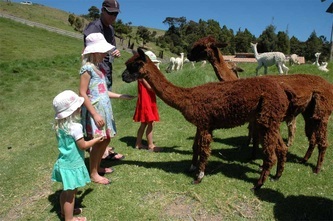 In spite of having so many people, and all the children wanting to "pat" them, the alpacas were all extremely well behaved. This was possibly due to being spoilt with plenty of handfuls of lucerne chaff. By the end of the day though, the girls and the cria were happy to get back to their normal paddock and have a rest. Next time we have an Open Day we will have to have a think about parking arrangements as there were a few exciting moments when there were cars going up the drive and meeting cars coming down head on !